KIDS and ORGANIZING ITEMS seems like won't go along well, at least per my experience. Good thing there are fun ways to do it, thanks to social media and internet inspiration. 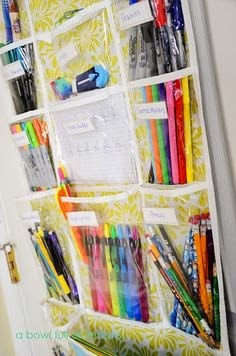 Yes indeed,I think this will be the solution for my wife's problem in organizing my child's pencils, colors and other small stuff that he used in the school. I also need a way to organize the kids' art materials and toys. So kalat! I'm also someone who's so sentimental over things, especially gifts. That's why I find it hard to declutter. Oh, that's cute! :D I think if we really instill discipline in our kids, they'd be better equipped. :) Kudos to you! That is a great organization idea. It is great that you have disciplined kids. great idea. id like to try this one out too. That's a really good idea. I have something like that but I used to put random accessories and toiletries on it.